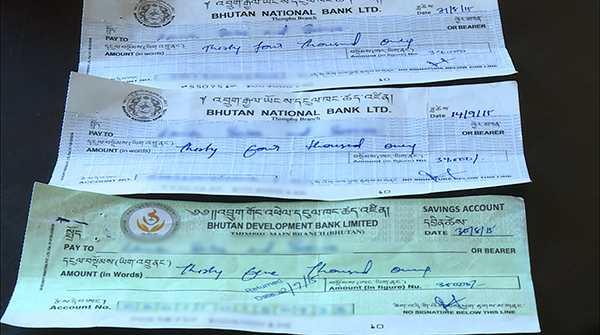 A man is allegedly conning shopkeepers in Thimphu and Phuentshogling by issuing fake cheques. The man, who owns a brokerage house in Olakha, apparently comes to their stores to buy commodities and instead of paying cash, he gives them cheques. However, when the shopkeepers try to encash, the cheques bounce. The shopkeepers say either there is no sufficient balance in the account or the account number is fake. The shopkeepers say the man comes to their stores well-dressed and furnishes them all his details, such as a copy of his driving license, mobile number, and his vehicle number. “We believed him,” said a Shopkeeper from Thimphu. The man supposedly carries three types of cheques from Bank of Bhutan, Bhutan National Bank, and Bhutan Development Bank Limited. Officials from the Bank of Bhutan say they have not received any formal complaints yet. However, they said the man had already closed his account with them. Bhutan National Bank’s officials said they tried to call the man but there was no answer. They say it is the Royal Monetary Authority’s job to create awareness among the people of such fraudulent activities. According to the Penal Code of Bhutan a defendant shall be guilty of the offence of fraudulent cheque writing, if the defendant issues or passes a cheque knowing that the drawer will not honour it. BBS tried to get in touch with the man but he did not answer the calls.